These ladies continuously astound me with their creativity and workmanship. Seriously. I can't even tell you what my favorite part is. I am in love with Laura's green strips on the bottom left, and Renee's birds, and Ashley's churn dashes. And there's a few blocks I'm not even sure who made them. Now, to quilt it... what color(s?) thread should I use? Black? I think I'll do an all-over design, or perhaps a kitchen-sink-like FMQ sampler. I'm going to back it in the Britten Nummer fabric from IKEA! I'm already getting stoked. Hopefully, this will be the summer of WIPs. I'll show you more, plus the signature blocks, when it's all done! 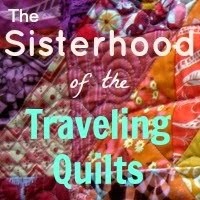 Everyone else's quilts should be popping up in the blogsphere throughout the summer! Linking up to Sew Cute Tuesday @ Blossom Heart Quilts and Fabric Tuesday @ Quilt Story. The colors on black really pop. Pretty cool color combo. Have fun! Now that is brilliant. Looking forward to seeing how you add your 'bit of wonder' to an already wonderful quilt. What a fun quilt. I was thinking black thread all over will blend in enough but the Ikea fabric is white background so maybe a gray thread ? That might be a tough decision. This does look very cool. I love how the colors pop. I think black on black quilting would look great, but black thread on the bright fabrics wouldn't look so good. The prayer quilt II made was similar and I did an all over sampler--just did what was right for each block using a royal purple thread: http://www.quiltsofafeather.com/2012/02/jessicas-prayer-quilt-finished.html So fun seeing this quilt top all together! I know whatever quilting you choose is going to be awesome--I can't wait to see what you do!! Oh Jess, I would say it made the stained glass effect perfectly! What a blessing! What a beautiful quilt! Maybe a variegated thread would work? 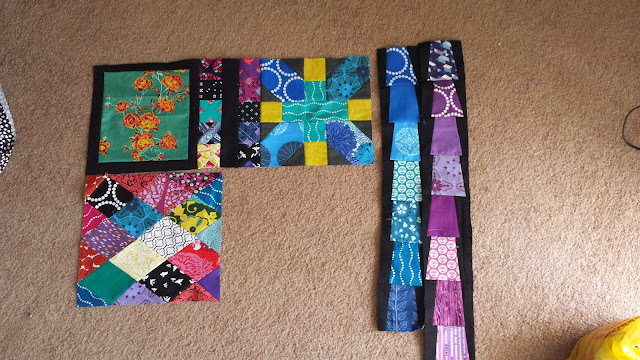 I think I would use a dark jewel tone thread - maybe a purple or the teal to match a couple of the blocks. Dark enough to not be too obvious but light enough to be able to see while you are quilting. absolutely stunning! I love this! How ever you quilt it will be beautiful! I wish I had ideas to pass around...but I'm drawing a blank on my quilting right now too. Lol. I think a nice purple thread would look fabulous if you want it to stand out a small bit, but black would look great if you don't. I truly love this. what fun! Gorgeous top! Love the black background. Such a pretty photo with the sun shining through! Looking forward to seeing just what you decide for the quilting! PERFECT QUILT BACK IDEA. Omg. It's going to make it even more perfect. obsessed.